Her stories have a gentle wistfulness, alternating between light and shadow, pleasure and pain, beauty and ugliness - all reflecting the contrasts that are so much a part of India. The title of the book itself is a double entendre, as her compositions 'haunt' at both a metaphysical and physical level. To 'haunt' is 'to appear frequently as a ghost', and also 'to recur constantly and spontaneously'. Both these meaning of haunting are played out in her book. Her stories of 'The Chowkidar', 'St. Anthony's Horse', 'The Guardian Angel' and her poem 'I Witness'- all have a supernatural element in them. On the other hand, her story 'Those Were The Days' and her travelogues and memoirs have her frequenting places in India where she grew up and lived. 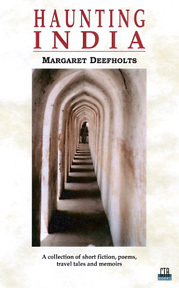 Margaret's language is lyrical, evoking exotic pictures of the splendor of India. But through all its beauty, one feels her sadness and regret, even to the point that she and India have had to go their separate ways. One senses it is Margaret who is haunted; it is she who is trying to recapture a mythical past. The theme of searching recurs again and again, along with the theme of belonging (this the title of one of her stories). In her retrospective she talks of her return to India in 1987, 'It would be easy to say I was cured of India after that first visit. But of course, I wasn't. I would return four more times over the ensuing years, still in search of my vanished yesterdays'. And so the book succeeds on several levels and ultimately expresses the joy and sorrow of being possessed by India. Whatever your literary interests Haunting India will touch you deeply and leave you with many haunting thoughts and memories, both of India and a first generation immigrant finding her roots.